I figure this is a good place to show some of the things we did this summer in Montana. 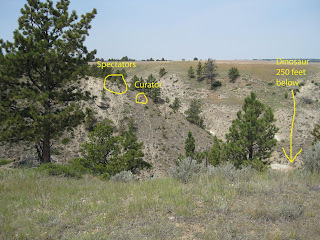 Nothing spectacular was found, but there was a lot of evaluation hole digging. 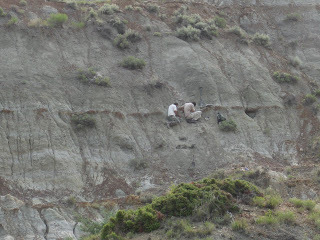 Above is Jacob and I trying to trace a thescolasaur on one of the easier to get to outcrops. The country was pretty rough at times. Here's an annotated photo of what we were dealing with. 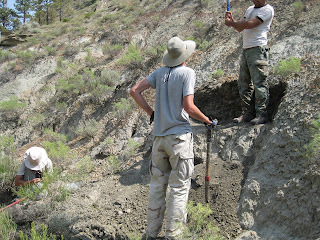 The crew was secretly hoping that there was nothing to the dino I found at the bottom of the gully. Right next to the stream/standing water, complete with flies, gnats and mosquitoes. While evaluating the site, Jacob and I discussed our options. Our helper Tor was trying hard not to be a witness. More photos to come in the coming days. Special thanks to Bill Montante for taking these pictures.